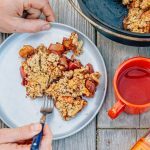 Soft cinnamon spiced apples, crumbly topping, and a sweet syrupy sauce, all baked to golden brown perfection inside a Dutch oven, this apple cobbler is a great dessert to enjoy around the campfire. 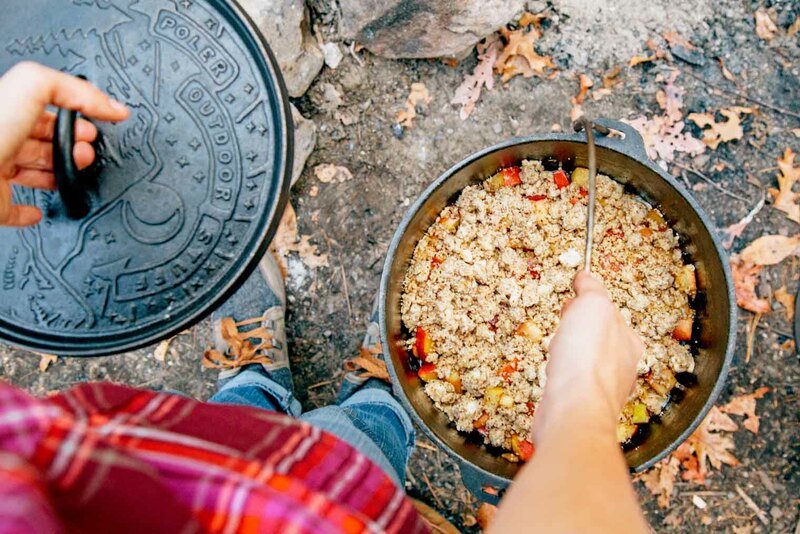 Baking with a Dutch oven can feel a little intimidating, especially at a campsite. But trust us, for this recipe, we’re using the word “baking” in the loosest possible sense. This apple cobbler is super simple to make and requires very little hands on work. So if you’re a little hesitant about cooking with your Dutch oven, this is a perfect place to start. 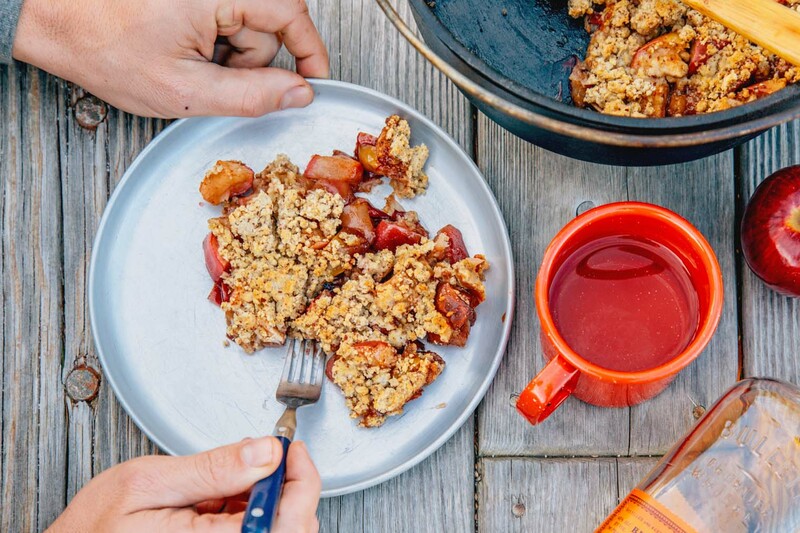 For the cobbler topping, you have the option of making it ahead of time at home or at the campground. It’s not particularly difficult to make, but if you’re cooking an elaborate dinner then why not reduce whatever steps you can. 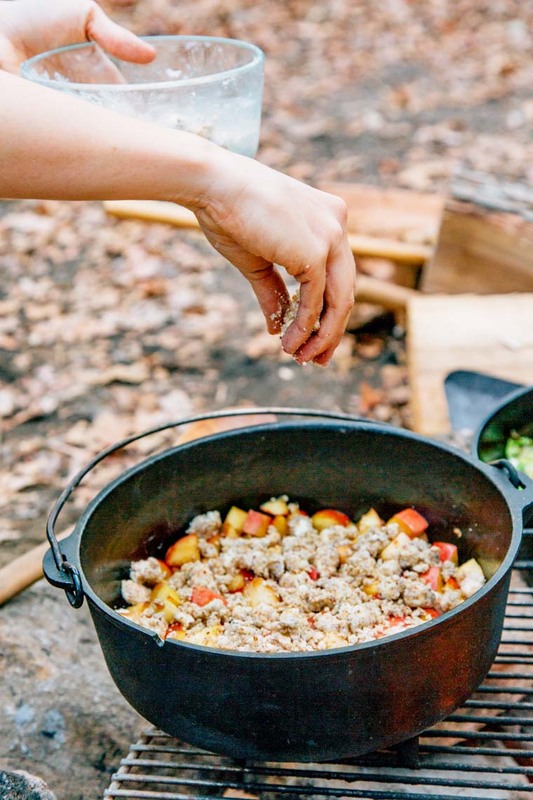 On location, slice up the apples, place them in bottom of the dutch oven, and mix them with the brown sugar and bourbon. Then cover top with your batter. If you’ve got a campfire going, then you can use the embers from the fire, or you can use charcoal. Thankfully cobblers like this are pretty forgiving. There’s a decent amount of moisture from the apples and the bourbon, so you’ve got a pretty wide margin for error. After about 20 minutes the apples should be soft, the topping fully cooked, and all the brown sugar and bourbon melted into a beautiful gooey sauce. ‣ Big production value for not a whole lot of work. ‣ The ability to prepare the topping ahead of time at home lets you focus on cooking dinner. ‣ Once it’s in the Dutch oven, this dessert is completely hands off. (It better be, that Dutch oven gets hot!) So, sit down, enjoy your dinner, and you dessert will be ready for you when you’re done. ‣ If you’ve already got a campfire going for dinner, then this is an excellent use for those burnt down embers. ‣ It’s important to use cold butter for the topping because you’ll be cutting it into ¼ inch cubes (this is impossible with warm butter). You’ll then knead the cubes into the flour (a fork works pretty well for this) until it has a coarse texture. The goal is to have an mix of flour, smeared butter/flour, and pockets of butter. ‣ While cobblers are very forgiving, you’ll want to avoid really over cooking it. If the sugars start to burn, they will adhere to the Dutch oven and make it difficult to clean. If you suspect it might be close to overcooking, check it. Er on the side of caution. ‣ You’re looking to heat your Dutch oven to about 400° F. For a 4 qt (10 inch) Dutch oven, you will need to use 18 coals on top and 6 coals on the bottom. If you’re using wood embers from your campfire, you’ll have to approximate. ‣ We used a 4 Qt. (10 inch) Dutch oven by Lodge. You can use a smaller Dutch oven for this recipe and it will work fine, but if your oven is larger, the filling will be too shallow. If that’s the case, add a few more apples. ‣ Bring a shovel to move the embers/charcoals. ‣ Heavy duty gloves and a lid remover are essential for dealing with a hot dutch oven. Don’t want to buy a lid remover? Use a folded metal coat hanger instead. MAKE THE TOPPING: Combine the dry ingredients in a mixing bowl. Add the milk and butter. Using a fork, mix until a crumbly dough forms, cutting the butter into the mix to form small pebble sized balls of butter and dough. Set aside, preferably in your cooler. MAKE THE FILLING: Core the apples and cut into bite sized (1/2 inch) pieces. Heat a 4 qt (10 inch) Dutch oven over medium heat. Add the apples, brown sugar, cinnamon, nutmeg, and bourbon to the Dutch oven and cook briefly until the sugar has dissolved. Remove from heat. 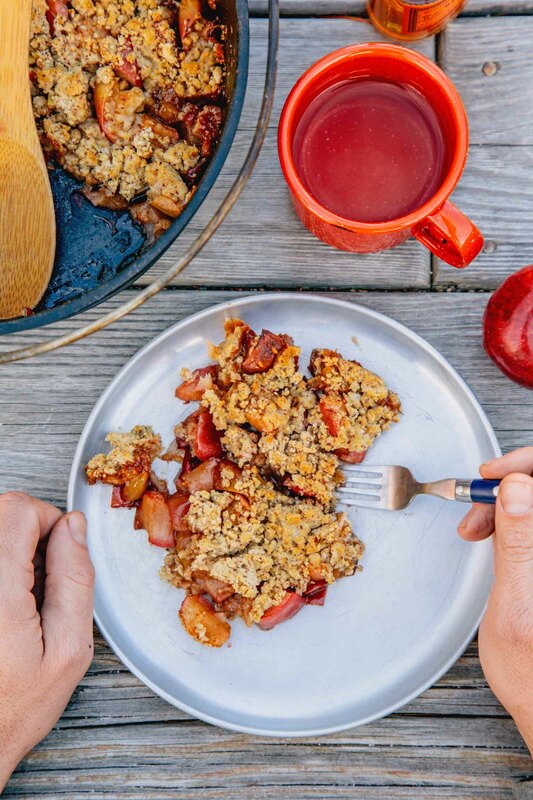 ASSEMBLE THE COBBLER: Crumble the topping over the apple filling in an even layer. Set the lid on the Dutch oven. 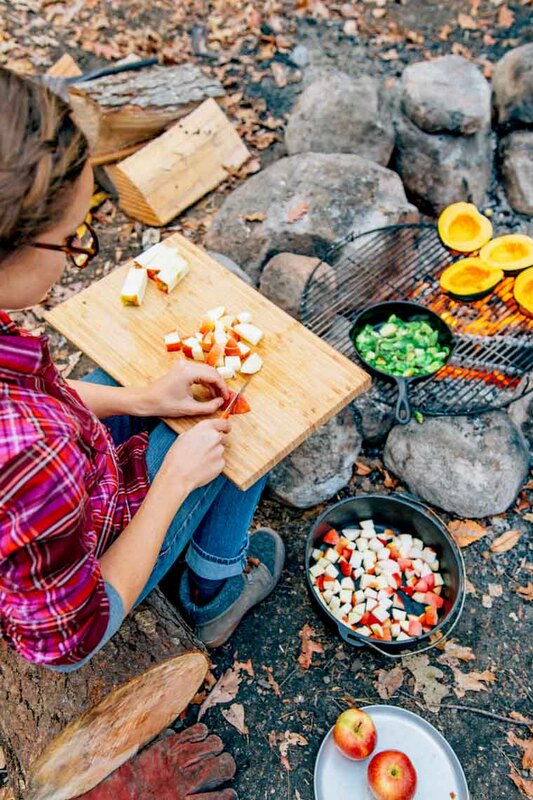 BAKE THE COBBLER: Place the Dutch oven on a ring of six coals, then evenly space 18 coals on top of the lid (this will create equivalent heat of a 400°F oven). Bake for about 20 minutes, until the topping is golden brown. We used Trader Joe's Gluten Free All Purpose Flour for this, though any AP flour should work fine. Would this recipe still work without the rum or bourbon? Yes, but you might want to splash in a bit of water to get the sugar to the right consistency. I made the topping for the apple cobbler, however, my topping is more like a dough instead of the crumbles (even though I used chilled butter). Do you think it’s still ok to use? I was thinking that I could just flatten it out and lay over top. Thoughts? Mine always comes out more doughy than crumbly. I just pull small pieces off and evenly space it on top of the apples. Tastes great and works.